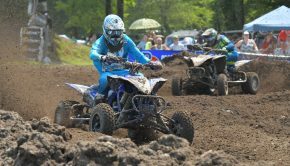 Yamaha recently invited editors from a number of top publications in the power sports industry to a private meeting in Greenville South Carolina to unveil their 2017 ATV lineup. Last year Yamaha somehow miraculously managed to replace an entire line of ATVs with the totally redesigned Grizzly 700 and all new Kodiak 700, serving different needs, rider sizes, and budgets. 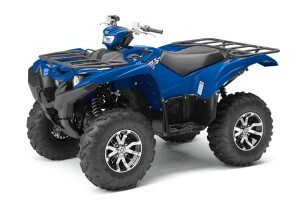 Last year saw the addition of the Raptor 90 to Yamaha’s sport ATV lineup. 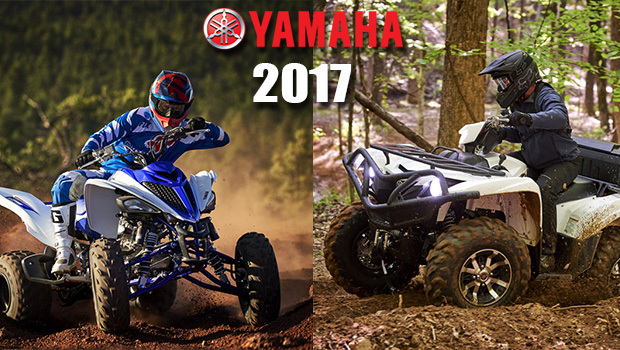 For 2017, Yamaha builds upon last year with added variations to their 4×4 lineup, plus the addition of a new sport ATV model. Below are all the details as Yamaha presented them. Taken From Yamaha’s official press release. 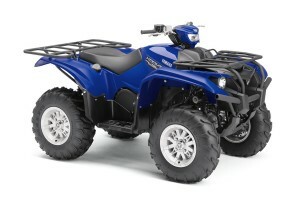 The all-new YFZ50 is designed to introduce riders ages 6-years-old and up to the fun and excitement of sport ATVs. 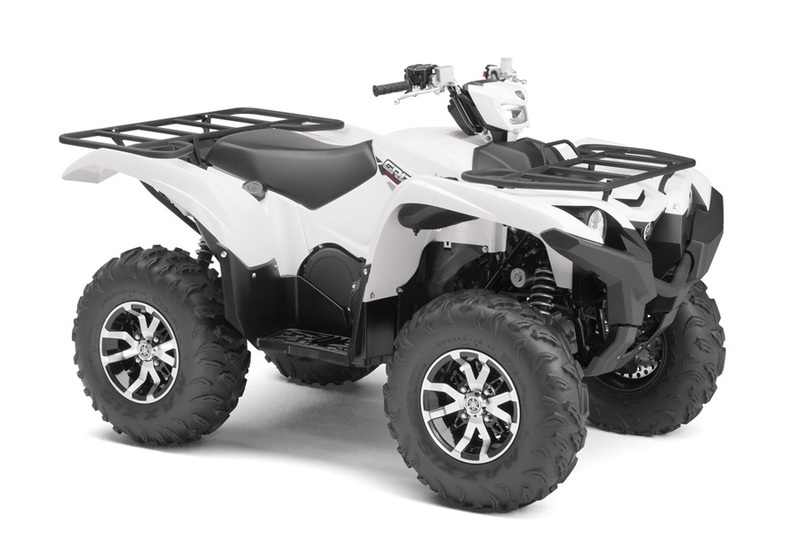 The all-new YFZ50 is designed to introduce riders ages 6-years-old and up to the fun and excitement of sport ATVs. With new styling based on the popular championship-winning YFZ450R, the all-new entry-level YFZ50 will bring the world of Yamaha sport ATV performance to more families and a new generation of motorsports enthusiast. 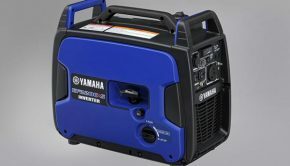 Built to Yamaha style and quality standards, the new electric-start YFZ50 mounts a 49.4cc air-cooled engine with a continuously variable transmission (CVT) on an all-new lightweight chassis. Parents can feel confident introducing their 6-year-old to ATV riding with parental controls integrated into the machine, including adjustable RPM and throttle limiters as well as a tether switch capable of shutting off the engine from a pull-string if or when needed. 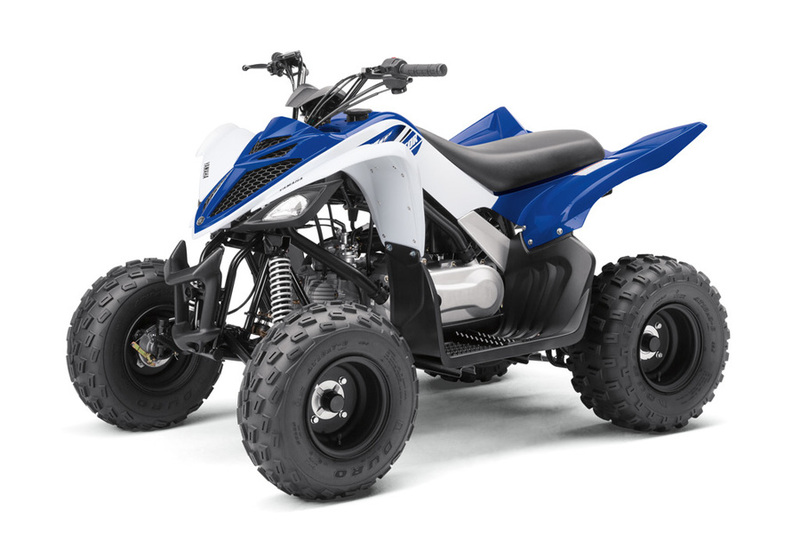 The 2017 YFZ50 comes in Team Yamaha Blue / White at a $2,099 MSRP. 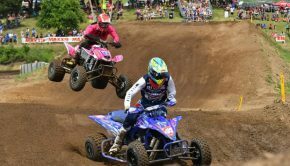 Parents can feel confident introducing their 6-year-old to ATV riding with parental controls integrated into the machine. 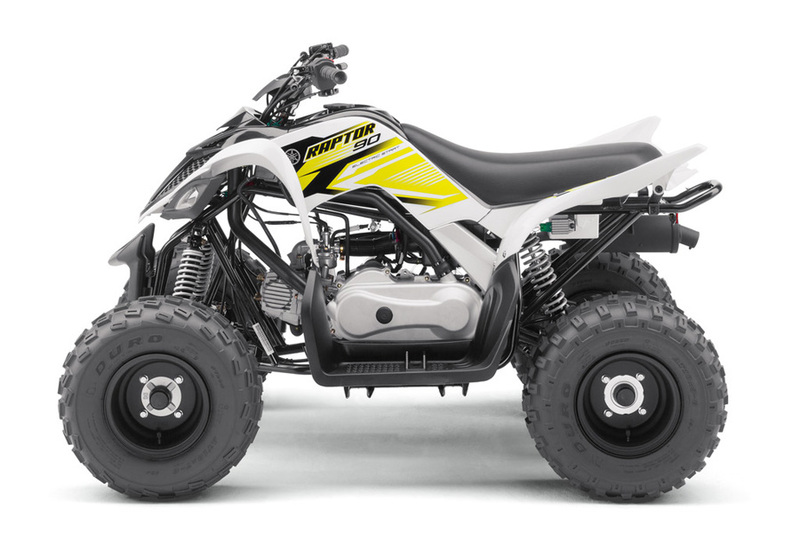 For riders ages 10-years-old and up, the Raptor 90 serves up styling and a sporty ride reminiscent of its big brother, the Raptor 700, but at a size and performance level appropriate for younger riders and budding enthusiasts. New for 2017, the Raptor 90 is now available in White, along with the Team Yamaha Blue / White. The Raptor 90 mounts an 89.9cc air-cooled engine with a CVT transmission on a newly designed lightweight chassis, providing seamless acceleration with no need for shifting. Reverse gives young riders more versatility on the trail. 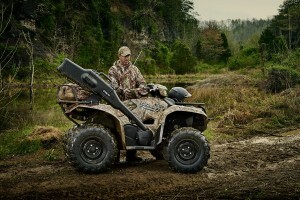 The Raptor 90 provides sporty performance while maintaining a comfortable ride and simple operation. Additional features that help provide increased performance and comfort include new front and rear suspension, 18-inch tires with lightweight matte black wheels, a plush seat and wider floorboards. The Raptor 90 MSRP is $2,899. increased performance and comfort are provided by new front and rear suspension, 18-inch tires with lightweight matte black wheels, a plush seat and wider floorboards. 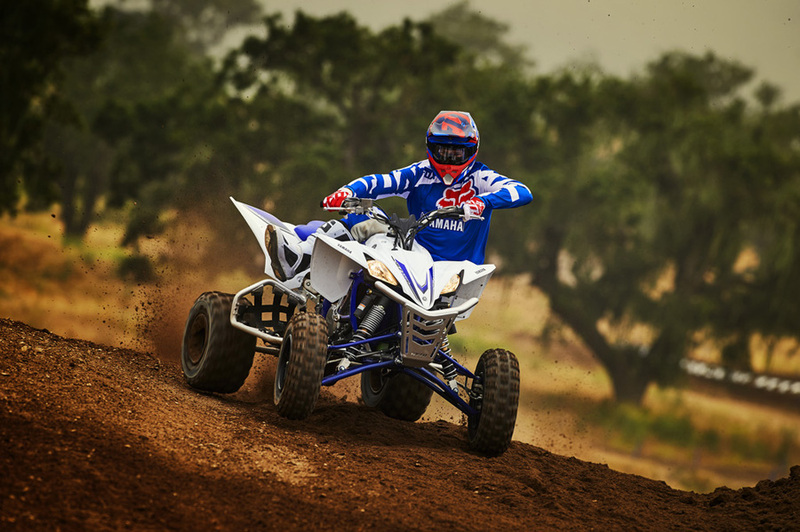 The Raptor 700R and YFZ450R are the best-selling and highest performing models in the world of sport ATVs. 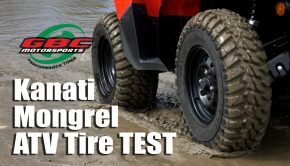 They epitomize the pinnacle of ATV performance and racing dominance on the track, trail and dunes. New for 2017 is a Blaze Orange Raptor 700 and a Team Yamaha Blue / White Raptor 700R with new Team Yamaha Blue seat, color-matched a-arms and frame. The 2017 Special Edition Raptor 700R comes in Grey Metallic with GYTR front grab bar and heel guards. 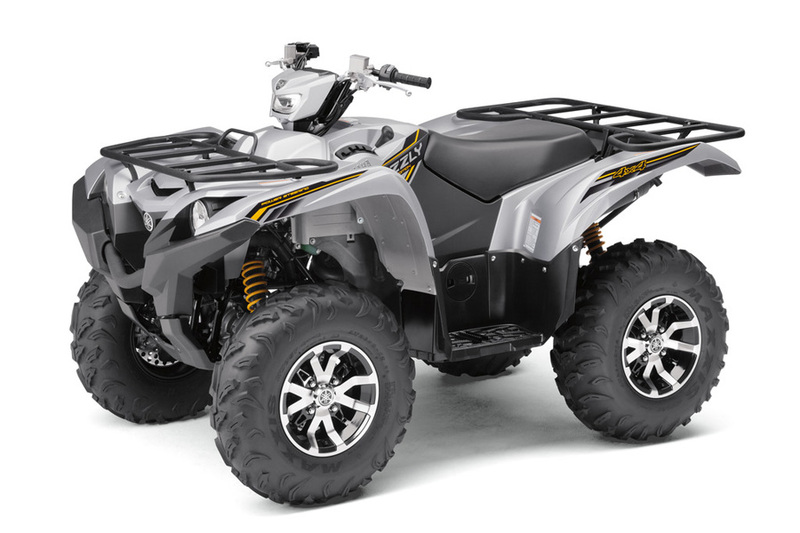 The Raptor 700 MSRP starts at $7,899. 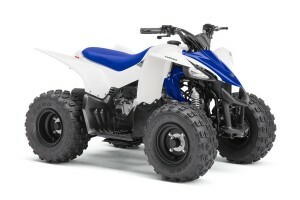 The new Yamaha Blue/White 700R features Team Yamaha Blue seat, color-matched a-arms and frame. The 2017 Special Edition Raptor 700R comes in Grey Metallic with GYTR front grab bar and heel guards. 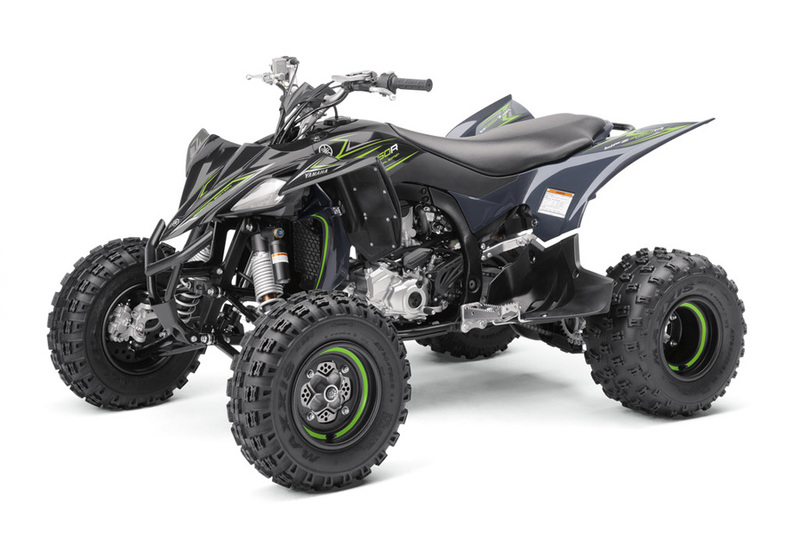 Reigning MX and GNCC champ, the unrivaled, race-inspired YFZ450R has a new SE in Black Metallic with GYTR front grab bar. The Team Yamaha Blue / White YFZ450R now comes with a new Team Yamaha Blue seat and color matched a-arms and frame. 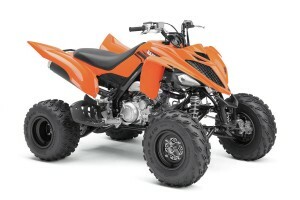 MSRP for the YFZ450R starts at $8,999. 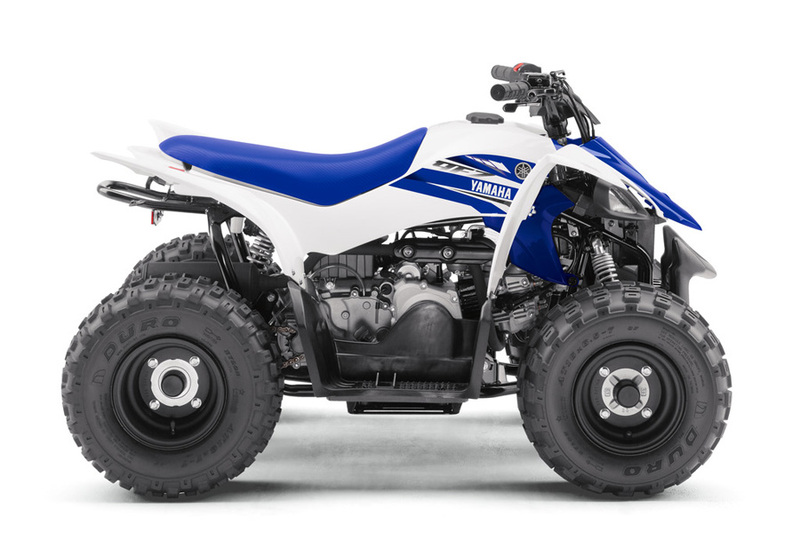 Pictured with optional GYTR bumper and nerf bars, the Team Yamaha Blue / White YFZ450R now comes with a new Team Yamaha Blue seat and color matched a-arms and frame. the unrivaled, race-inspired YFZ450R has a new SE in Black Metallic with GYTR front grab bar. Boasting superior handling, comfort and performance purpose-built for exploring, hunting and recreational riding, the 2017 Grizzly is designed to be the most comfortable, off-road capable and durable big bore ATV. New for 2017 is a Matte Silver SE with machined aluminum wheels, painted plastics and special graphics, a new Alpine White model with machined aluminum wheels, and new Steel Blue model with machined aluminum wheels. In addition, now all Grizzly ATVs will be equipped with EPS. The 2017 Grizzly is also offered in Hunter Green, Realtree Xtra® and the Crimson Metallic Limited Edition (LE) featuring painted plastics, special graphics, machined aluminum wheels, removable fairing with windscreen, heated grips, thumb warmer and heated seat. 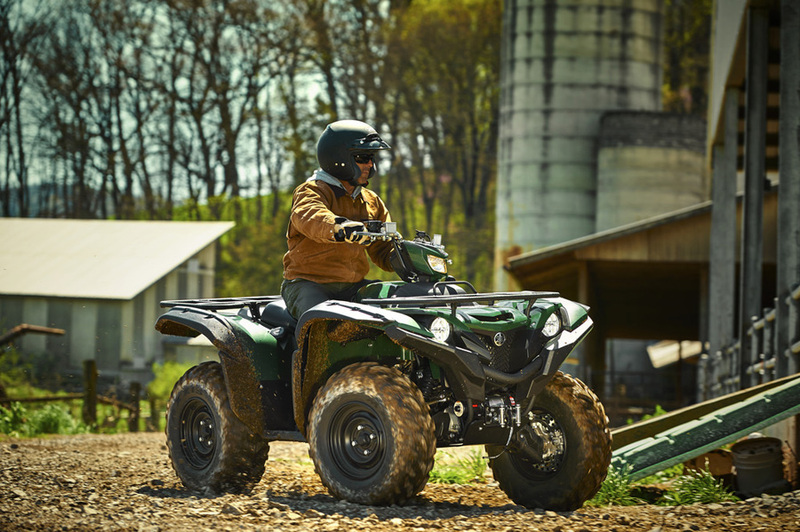 The latest generation Grizzly features aggressive styling with redesigned front and rear fenders, a handlebar mounted work light, 26-inch tires, twin-piston four-wheel disc brakes, superior suspension, and Yamaha’s proven core drivetrain technologies. Along with Yamaha’s proven Ultramatic® transmission, the 2017 Grizzly delivers optimized engine character for recreational riding featuring a 708cc engine with more power and torque than previous models. Yamaha Grizzly’s handling, performance and off-road capability provide the rider with confidence and comfort, all at an MSRP starting at $9,699. The Crimson Metallic Limited Edition (LE) featuring painted plastics, special graphics, machined aluminum wheels, removable fairing with windscreen, heated grips, thumb warmer and heated seat. Redefining the mid-size utility ATV category, the Kodiak 700 is built for work with a comfortable and compact feeling new chassis. The 2017 line of Kodiak 700s include a new Midnight Blue Metallic SE with silver metallic painted wheels and Yamaha’s legendary On-Command® four-wheel drive system, a new Steel Blue model with cast aluminum wheels, along with Hunter Green, Red and Realtree Xtra® models. The 2017 Kodiak is also available in Hunter Green, Red and Realtree Xtra® models. Styling, smooth power and torque create the foundation for a range of features that all combine to make the Kodiak 700 ATVs the most powerful in their pricing categories, while maintaining Yamaha’s legendary durability and off-road performance. The Kodiak 700 features a 708cc engine with engine character optimized to deliver smooth power and strong torque for all-day comfort and ease of use. All Kodiak 700s feature Yamaha’s proven Ultramatic® fully automatic transmission with high, low, reverse and neutral, providing the industry’s most durable CVT transmission and the most natural-feeling engine braking throughout the RPM range. 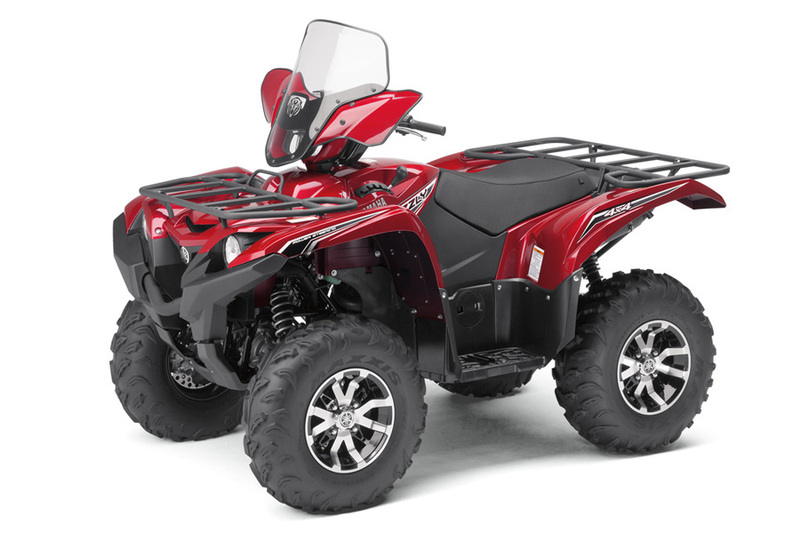 MSRP for the Kodiak 700 starts at only $6,999. 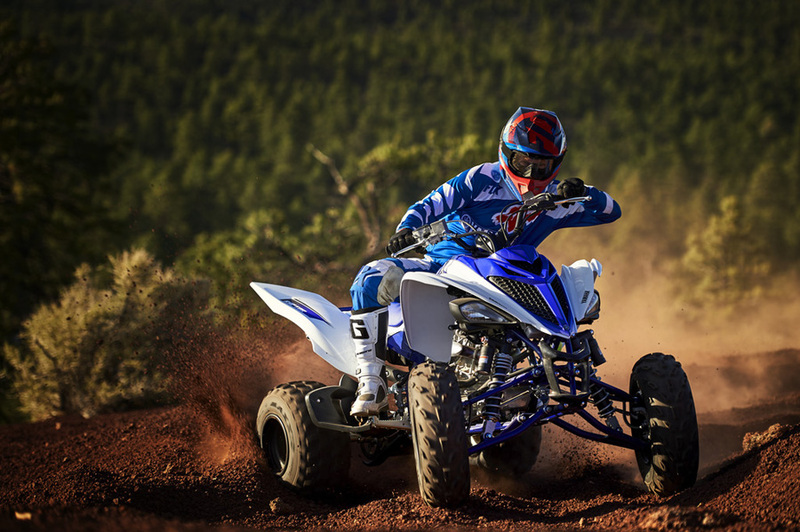 Every Yamaha SxS and full-size ATV is Assembled in the USA at Yamaha’s state-of-the-art manufacturing facility in Newnan, Georgia, for worldwide distribution.